The old adage rings true as a nor’easter bears down on Boston. And while this storm sloshes onto city streets, there’s a beautiful scourge that is wreaking havoc on Caribbean reefs every day. Indo-Pacific lionfish have become an abundant invasive species throughout the tropical eastern Atlantic Ocean and Caribbean Sea. They are now recognized as one of the most important conservation issues in the world. This is because they lack any natural predators and have voracious appetites and impressive reproductive skills. 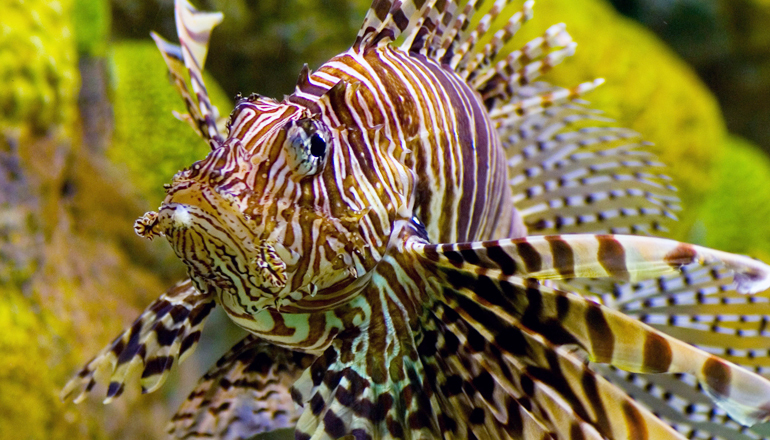 Lionfish could become the most abundant fish species on coral reefs, displacing many other species that contribute to the health of coral reefs, which face many threats already from climate change and overfishing of other native species. Recently, some efforts to manage this invasion have taken the form of creating a fishery for lionfish and a demand from the fish-eating public. The good news is they are great to eat. 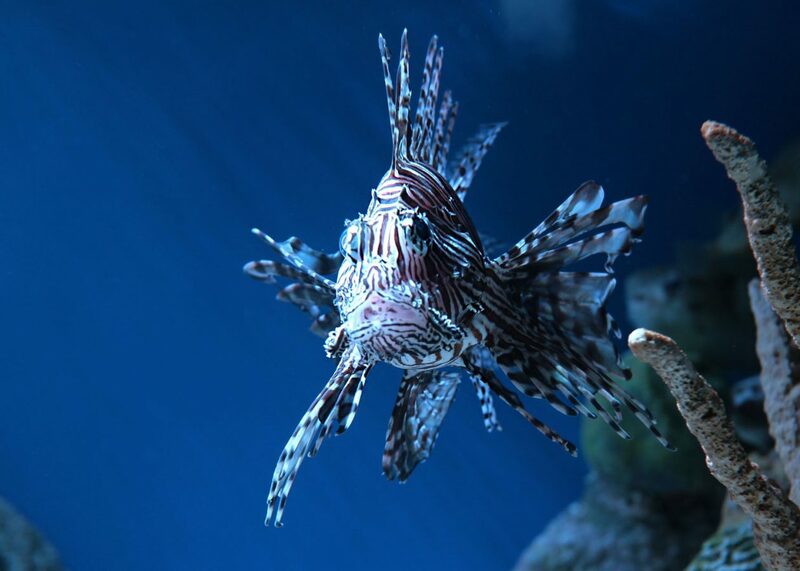 A lionfish swims in the Aquarium's Armored and Venomous exhibit. This beautiful species was first spotted in the Atlantic Ocean in 1992. One theory is that Hurricane Andrew smashed somebody’s home aquarium in Florida, causing a couple of lionfish to be swept into the ocean. Since then, it hasn’t taken the lionfish population long to completely explode in the Atlantic. It’s not hard to see why these fish are prized in home aquariums—they’re beautiful. You can see several in our Armored and Venomous display in the Tropical Gallery here at the Aquarium. Our aquarists have to use special precautions when working with these animals. They wear protective gloves and always work with a buddy, just in case someone gets stung. It’s not a deadly prick, but unlucky divers have said it is unbelievably painful. At the end of the day, it will take the hard work of everyone—scientists, conservationists, fishermen, and chefs—to help eradicate lionfish from areas where they don’t belong. 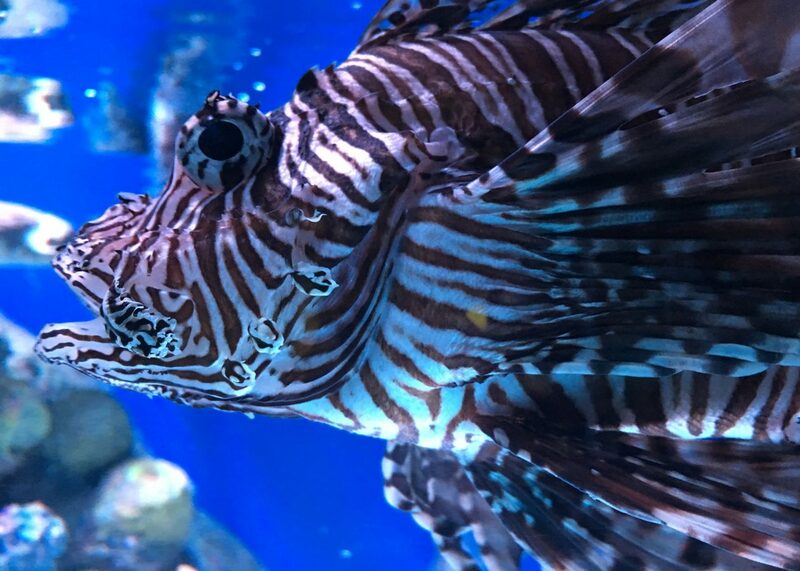 You can always enjoy their beauty from behind the glass here at the Aquarium as they raise awareness about the threats they pose to Caribbean reefs. This blog post is a combination of several previous posts from our historical blogs.